Photograph of WWII veteran Sgt. Isaac Woodard Jr. with his eyes swollen shut from aggravated assault and blinding. The photo was distributed for a November 1946 speaking tour by Woodard and Thurgood Marshall. (CNN) - A South Carolina town has honored an African-American World War II veteran more than 70 years after he was beaten and blinded by local police. Officials and community leaders in Batesburg-Leesville unveiled a historical marker of the attack on Sgt. Isaac Woodard Jr.
Woodard had just gotten out of the Army in February 1946 and was on his way home when he got into a dispute with the bus driver after asking to get off to use the bathroom. The driver complained to the Batesburg police, including Lynwood Shull, the town's white police chief. 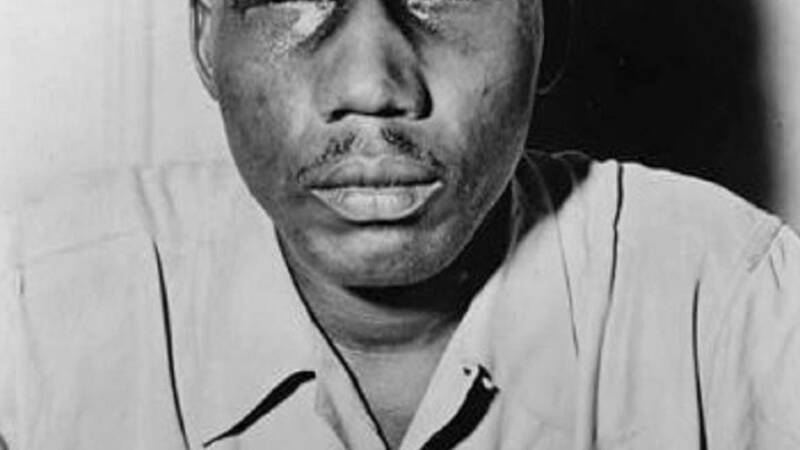 They brutally beat Woodard, who was still in his Army uniform, and thew him in jail. He was convicted of drunk and disorderly conduct and fined. The officers were later charged with violating Woodard's civil rights and acquitted. "I am sorry that this happened and I apologize for this happening," said Batesville-Leesburg Mayor Lancer Shull during the dedication ceremony. The mayor shares the same last name as the police chief but says they are not related and that his family comes from Missouri. Shull and other city officials worked to vacate Woodard's conviction last year. "Forgiveness does not condone and it does not forget the act, but for those of us, we can vow to make sure that this act never happens again," he said. Woodard died in 1992, but his nephew, Robert Young, and other relatives came from New York for the ceremony. Young said his uncle was his best friend, a leader in their community and his family's "illustrious, famous hero." "Although they took his sight away in the end he was still able to see the creation of appropriate and specific laws needed to fight the inequities and injustice that he suffered at the hands of his fellow men as he returned from the war that he had no say in," Young said. The attack helped inspire President Harry Truman to create the President's Committee on Civil Rights and to integrate the US military in 1948. Woodard joined the US Army at Fort Jackson in nearby Columbia, where more than 48,000 soldiers go through basic training each year. Fort Jackson's commander, Brig. Gen. Milford Beagle Jr., is African-American and said that Woodard helped pave the way for him and made the military stronger and more diverse. He said he hoped that Woodard never doubted that his sacrifices made a contribution. "He helped build the bridge that many like me used to cross the river of inequality injustice and prejudice," Beagle said. "The pain that he suffered led to the betterment of future soldiers, the Army and our nation."